A recent article in the Washington Post describes the current thinking of many Japanese working women—why should I complicate my life by getting married and having children when my husband won’t help me raise them? Japanese women have been complaining about the poor quality of family life for years and years, and have dealt with it in a number of ways, including resignation (the stand-by Japanese phrase, shikata ga nai, which means there’s nothing one can do about it). 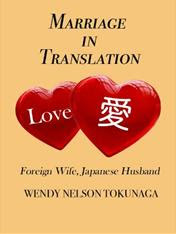 Karen Kelsky, in her book, Women on the Verge: Japanese Women, Western Dreams, wrote in 2001 of young Japanese women escaping Japan, and moving to foreign countries, often marrying Western men as their ticket out of a straitjacket society. This book and other observations were in part the inspiration for my novel, Midori by Moonlight about a Japanese woman who impulsively becomes engaged to an American English teacher and moves to San Francisco with him, only to find herself dumped a few weeks later. Other Japanese women who choose to stay in their native country are delaying marriage and postponing childbirth. The reason this is news now is because of the plunging birthrate in Japan and the graying of society. According to the article, Japan, with the world’s second-largest economy has the lowest proportion of young people under 15 and the highest proportion of people 65 or older. Unlike some women in the United States, very few Japanese women want a baby at all costs and will simply not have one if they can’t find the right guy to marry. Out of wedlock births and adoption (whether by a single parent or husband and wife) are quite rare in Japan. Women basically have two choices: having a career and being financially independent, but remaining single and without kids, or getting married and becoming a full-time mother (to both children and husband). Throw in the classic overworked Japanese male and you have a recipe for disaster when it comes to keeping the population humming. Prime Minister Fukuda (who just resigned the other day, but that’s another story) put together a task force last December on “work-life balance” that hopes to pressure companies to send their employees home at a reasonable hour to improve the quality of family life, finally addressing Japan’s addiction to overwork. It’s a noble effort, but knowing how slowly things move in Japan, I don’t hold out much hope that anything will change this depressing situation anytime soon. I just found your blog and I am really enjoying it! I am almost finished reading Midori by Moonlight and I can't wait to read the next book! You did a great job of capturing how America looks to folks from other cultures. I have two children [adopted at 13 and 10] so I understand what it's like to see someone struggle to learn English, and fit into American society. A sense of humor is essential. It's too bad Japanese women won't adopt. I adopted my children after I gave up on finding a guy, and now I feel like my family is totally complete. There are always options.. Thanks very much, Dee. Yes, there are options to women in the U.S. and it's too bad that Japanese society seems so closed off about adoption. Perhaps this is something else that will change with time. It's also amazing to notice the contrast with young Japanese men. Even though they are also faced with diminishing job prospects and trouble finding a mate, marriage to a--shudder--Western woman and/or living abroad is rarely mentioned as an alternative.